The latest report by The Cornucopia Institute has uncovered serious problems in cosmetics industry regulations. Regulatory weaknesses and loopholes allow for the use of questionable, even harmful ingredients in personal care products that could negatively impact the health of the users. All cosmetics and personal care products, such as toothpaste, fall under the Food and Drug Administration and remain essentially unregulated. Some of the hazardous ingredients and contaminants found in toothpastes are irritants, allergens, endocrine disruptors, or carcinogens. 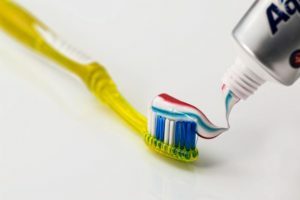 Dr. Bronners, Green People Toothpaste, Happy Teeth Toothpaste, Miessence Toothpaste, and Made Simple Toothpaste are among the top rated brands on the Cornucopia scorecard. These brands can often be purchased at your local health food store or online. You can also make your own all-natural toothpaste! See the recipe below.